Finally, some rain, wind, and cooler weather! My wife thinks I'm sick, but to me there is no better feeling than crisp air and summer fading into fall. It's truly the best time of the year. We had some good pushes of salmon in the Lake Michigan tribs recently. Look for salmon numbers to increase in the following weeks. 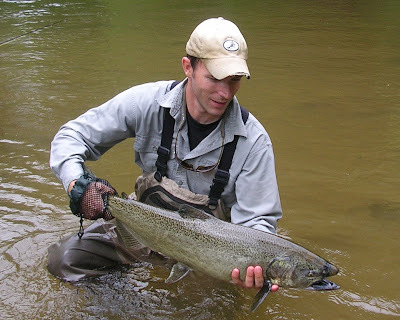 Target the lower rivers and river mouths for your best shot at an active fish. Salmon hold in the deep holes and log jams to rest before making another charge upstream. First salmon of the year crushed an orange egg sucking leach. Absolutely gigantic fish!!! Definitely inspired me to limber up my 8wt, sinking line, and tie up some big flashy flies this weekend. Planning on hitting one of rivers on the west side of state next Wednesday after work and try them out. My wife is actually a winter person like me so she hates the ridiculusly hot summer we just went through...So I say bring on the fall and winter with big fish and few people on the rivers! Thanks!!! Lots of boats in the bay when I drove though there Thursday night. You should have good fishing!